A presentation by RAYA ANI and ZAYAD MOTLIB on Monday, August 27 will be held at the Iraqi Engineers Union - Al Mansour, Baghdad at 5-8 pm. Free and Open to all Architects, Faculty of Architecture, and Architectural Students. - Latest work and processes by AmorphouStudio. - Joint presentation on the program and the learning objectives of the Baghdad school. This will be followed by an interactive discussion on the summer school program and objectives and to decide on the best time frame to hold the school. 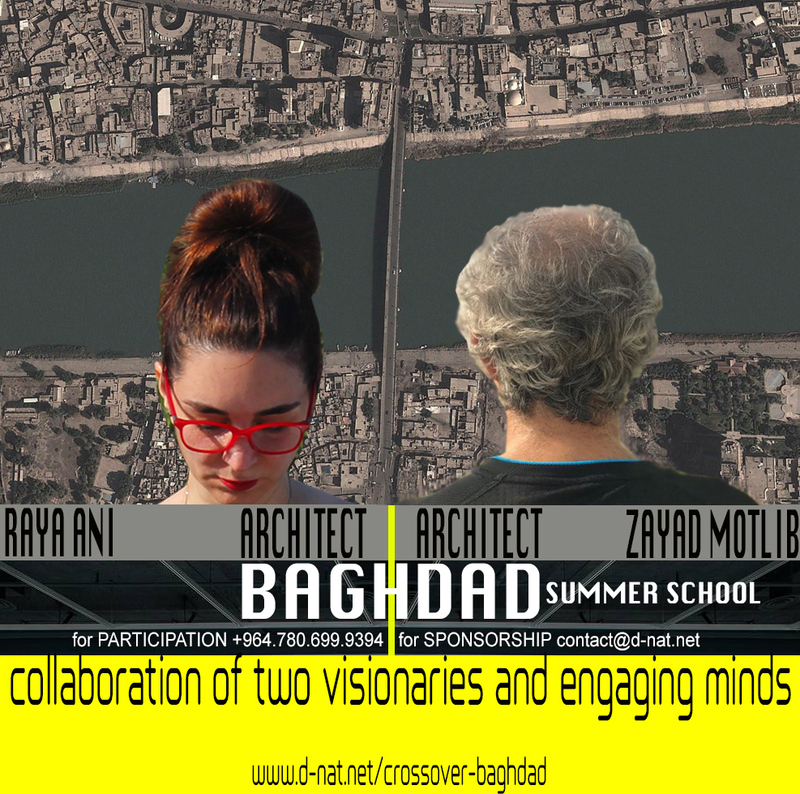 An architectural summer program, which operates under CROSSOVER educational initiative, envisioned and directed by two architects: Raya Ani and Zayad Motlib. The CROSSOVER summer school is an educational program that takes place every summer in a different city around the globe with a common theme of bridging divisions whether social, environmental, cultural, physical, or technological. The CROSSOVER educational program is based on the cross-pollination of disciplines, generations, skills, systems, processes, and typologies. The program tackles urban and architectural challenges related to a particular context of a city. Through the cross-pollination of disciplines, the studio emphasizes on systems rather than on individual solutions to re-think complex challenges by offering new discourses and narratives. It is the fusion of academic and non-academic knowledge, the theory and the practice. The program includes field studies, technical tutorials, and lectures that aim to expand participants’ knowledge. It also includes presentations and crit reviews by a number of renowned academics and practitioners. Over the past years, the city of Baghdad has experienced an unprecedented process of divisions and segmentations, which resulted in the fragmented city we know today. This process of dividing urban areas into pockets characterized by high concrete walls has transformed the city into separate zones and communities. Baghdad has always been characterized by its Tigris River; a vital element connecting both sides of the city via number of bridges. Due to the new divisions, these bridges started to amplify separation rather than connectivity of the two sides. The studio will investigate the architectural and urban challenges of the divisions across a selected area of Al-Ahrar Bridge. The six-day studio will introduce a range of design strategies and techniques aiming at transforming the two sides of the river into a cohesive urban connection. Taking inspiration from local craft techniques, cultural references, and contextual data, design schemes will be developed using a combination of parametric techniques and material-based design investigations. We will visit the selected site around Al Ahrar Bridge and will collect relevant urban data related to the project. We will analyze the collected data and study ways of implementing them as design parameters to inform the concept generation. The proposed workflow will combine the use of Rhino and Grasshopper with selected plug-ins. In the afternoon of the third day, participants will split into groups to work on their own projects, with direct supervision by the studio leaders. In the afternoon of the last day, groups will be presenting their projects for crit and public discussion. Prototypes, Powerpoint presentations, and animations. The course is open for all architectural students, undergraduate and postgraduate, and practitioners. - No pre-requisite skills required. Participants should bring their own laptop with pre-installed software. Software download links will be given after registration.